Question: Which LEO satellite lost over 30 km of altitude in the geomagnetic storm of 13-14 March 1989? This appears to be an error that has propagated from paper to paper over the years. Examining the original paper cited by all these other authors, "Effects of the March 1989 Solar Activity" by Allen et al. shows us that the actual altitude loss was 3 miles (not 30 km) and the satellite in question was "the aging NASA satellite SMM" aka Solar Maximum Mission, (which incidentally had already been repaired by a Space Shuttle crew in 1984). The linked pdf of the original paper is not searchable, but you can find the satellite effects described about the middle of the left-hand column on page 4 of the pdf (page 1488 of the document). 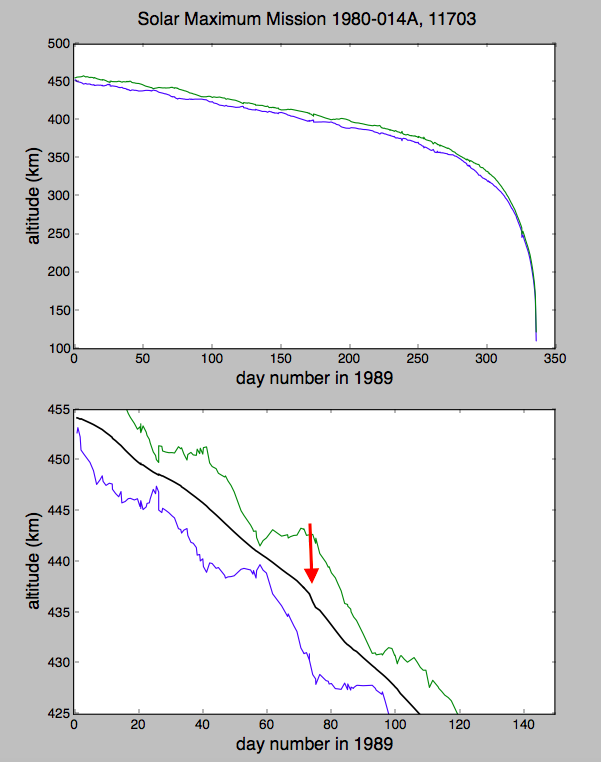 After reading @OrganicMarble's answer and the link there as well, I looked at the TLEs for the Solar Maximum Mission in 1989 (1980-014A, 11703) and while the altitude loss in March does not seem to be in any way dramatic overall, there is in fact a drop in the average altitude at the time. I've propagated the TLEs for one complete orbit starting at the epoch of each TLE and plotted maximum and minimum values, and for the second plot also included the time-averaged altitude (averaged over one orbit, at epoch). At about day 73 there is indeed a sudden drop in altitude, although it seems more like only a 1 kilometer "brick wall". The loss in altitude is not the problem as much as the fact that even a tiny but unexpected change in altitude will change the period, and so the object will move faster and will not appear where it is expected. This advance in phasing is probably a better way to think about the cause of the sudden loss of tracking, rather than the altitude itself. A drop of 1 km will shorten a 5595 second period by about 1.2 seconds. At a velocity of 7.65 km/s, a 1 kilometer drop in altitude advances the satellite by about 6.1 km per hour, or 145 kilometers per day. So it won't be anywhere near where it is expected the next time one looks for it. Not the answer you're looking for? Browse other questions tagged low-earth-orbit tracking space-weather or ask your own question. How can I plot a satellite's orbit in 3D from a TLE using Python and Skyfield? Documented economics of STS Solid Rocket Booster reuse? Why is the life span of a LEO satellite less than that of a GEO satellite? How risky is launching a rocket during a geomagnetic and solar radiation storm?